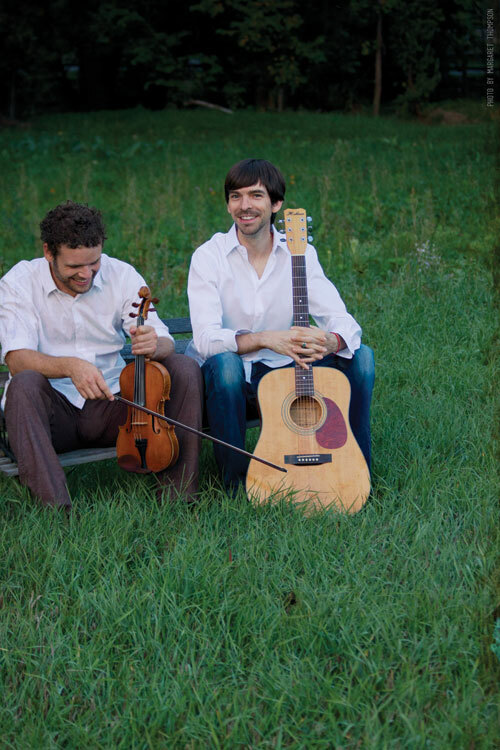 Adam Agee and Jon Sousa are two of Colorado’s most sought-after traditional Irish musicians. Since 2004, they have been journeying together through the Irish idiom on fiddle, guitar, and tenor banjo, enchanting listeners on both sides of the Atlantic Ocean. Adam and Jon have put down musical roots in County Clare, where they lived together, and now make frequent visits. Their connection to their instruments and the transcendent energy in their music is guaranteed to captivate and uplift audiences of all ages. In recent years, they have appeared at Colorado’s Spanish Peaks International Celtic Music Festival, where they performed on stage with Martin Hayes, Dennis Cahill, John Doyle, Robbie O’Connell, and others. They were also honored to headline at the first annual Durango Celtic Festival in March of 2013. Jon Sousa fell in love with music at an early age, listening to the 70’s folk albums in his mother’s record collection. He journeyed on to rock music, passed through the realm of electronic dance music, then made his way on to West African percussion, and finally landed in the world of traditional Irish music. Jon’s passion for music has taken him all over the world, from the beautiful countryside of France to study with master fingerstyle guitar player Pierre Bensusan, to Senegal, West Africa, to study Sabar Drumming, and eventually to reside in Ireland in 2008. There he refined his skills in interpreting Irish music while earning his Master of Arts degree in Traditional Irish Music Performance at the University of Limerick. Jon also has a Bachelor of Arts in Music from Naropa University in Boulder, Colorado.